I would so try this if I had plain glass candlesticks. I love this look! I think this easy grouping would make the cutest centerpiece. What do you think? I have some vintage ornaments (almost identical!) in a silver compote. They look so pretty with a bit of greenery! Hope you are enjoying the festivities of the season. I have a few ornaments like that. They belonged to Keith's Grandmother and I'm terrified of breaking them! I love it! I need to find some more candlesticks at the thrift store! Hugs! 1-I used to have simple glass candle sticks like that. Wonder what ever happened to them?! I have noticed really inexpensive ones at Hobby Lobby that would work. I not only love it, but it is an easy fix when you are pressed for time especially at this time of year. I have some ornaments like that and a few glass candlesticks. I love it too. This would be one of those decorations that would have the whole house quietly staring sideways at me wondering how far I will go with my decorating binges. Ha! Great idea. So simple, yet festive. 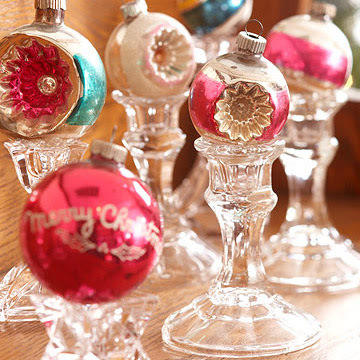 Love vintage ornaments. This is a great idea. I found clear glass candlestick at the dollar store. Have a great Thursday! Love it! Ricki Jill, do you have a store called Dollar Tree? They have those exact candle sticks for $1 each. So very simple but so very lovely! You know you can get those clear glass candlesticks in various heights at the $Store! Endless things you can do with those little things -- super cheap, but they don't look cheap!